This week I finally acquired and setup my vintage Yamaha DX system as seen in the photo above. From the top there is a Yamaha RX11 drum machine which is connected via midi to the Yamaha TX816 channel 8 midi thru. On down the line is the Yamaha QX-1 Sequencer. All midi outputs are connected to the midi inputs of the Yamaha TX816. Underneath the Yamaha QX-1 is the almighty Yamaha SPX-90 which is sent to the aux effect input 1 of the Yamaha MV-802 down below. The Yamaha MV-802 mixer is receiving the 8 audio outputs from Yamaha TX-816 at the bottom. The Main outputs from the Yamaha MV-802 go out and into a Roland VS-2480. Finally the Yamaha DX7 mki ( not pictured ) is connected to the midi in jack of the Yamaha TX816 and acts both as a controller and an additional DX7 synth module. In total there is the RX11 drum machine, 8 Yamaha TF1 sound modules, and the Yamaha DX7 itself. The Yamaha SPX-90 and MV-802 are not necessarily needed as I can run everything into the Roland VS-2480 and use the four on board sound effect cards. However, for nostalgia purposes, I chose to run everything together which sounds pretty cool. I can use the SPX-90 for special effects for one or two fo the TF-1 modules. I usually use the Roland VS-2480 for the overall effect output. Here are some observations of setting up and make use of the system. 1. The Yamaha DX7mki and the SPX90 produce the most unwanted noise. You have to keep input normalized or use a noise suppressor to keep unwanted noise under control. 2. The TX816 is actually very quiet and sounds AWESOME! It simply ROCKS and I’ll never get rid of it. Note that I’ve already had to change two batteries. I simply desoldered the old ones and installed new battery holders. The TF1 modules are very easy to solder and replace the battery. On one TF1 module I have a very strange occurrence. On TF1 module 6, the XLR jack will not work unless connected directly to the Roland VS-2480. If connected to any of the Yamaha MV-802 inputs it will cease to function, as in no output. The battery has been changed and the XLR jack has been inspected. For some reason it just won’t work with the MV-802. Weird!!! In any event, it works perfectly with the Roland VS. Also the other seven TF1 modules work perfectly when connected to the MV-802. 3. The Yamaha QX-1 works great with the newly installed HxC floppy emulator although I have to use version “HXCFE_V1_8_1_9a.upd” in order to get it to work well. The QX-1 was originally built and used with this setup so it naturally works very well. 4. I have the Yamaha RX-11 set to midi channel 8 and it’s connected to the 8th channel midi thru of the Yamaha TX816. This starts the RX11 drum machine during both playback and recording on the Yamaha QX-1. It works great, however, if you get a midi traffic jam, you have to reset the midi “panic” on the Yamaha RX11. If you run it directly from the TX816 channel 8 midi output it will work better, but then you lose a TF1 module, so it’s best to use the midi thru as indicated in the manual. Note Channel 8, ( the last TF1 module in the TX816 ) is what sends the midi clock output and start/stop/continue commands. 5. All of the stuff gets WARM! It’s hot here in Japan and my room gets even hotter with this stuff turned on for most of the day. Probably the Yamaha RX11 gets the hottest interestingly enough. 6. This setup obviously uses a lot of cables!! I think I’m using 22 cables in all on the back….laugh. 7. The Yamaha QX-1 works great and you can save your tracks, BUT due to the use of the emulator you can’t extract any sequence files. Thus you’ll have to import or export the old fashion way by recording your midi. If you stick to the SD cards and the HxC emulator, it all works great. Using a QX-3 or QY-700 for example you could then have actual floppies with ESEQ or SMF files. 8. I use a MacBook Air and SysexLibrarian to load up the Yamaha TX816 with patches. I’m currently working on a DX7 editor using MidiDesigner on my ipad. That should work great with either the DX7 or TX816. 9. The original Yamaha DX7mki was built for this setup and it works fantastic as a controller. 10. All of this Yamaha gear is built VERY WELL. My Yamaha TX816 arrived with a severed power cord and two dead batteries in a couple of TF1 modules. Now all is repaired and working well. I still have that weird XLR jack problem with one connection cord and my mixer, but it does work so I can’t complain. I’m sure I’ll figure it out one of these days. 11. LOVE the Yamaha RX11 drum machine. PUNCHY PUNCHY PUNCHY!!! 12. Yes, I have and use Native Instruments FM8. I like it very much. It’s probably more practical and maybe sounds just as good if not better to some people’s ears. I grew up in the 80’s and for that I’m forever cursed or fortunate to be attracted to this vintage beast of a setup…laugh. If you’re young and reading this article you may one day understand when you hit your late 30’s or 40’s. If I had to substitute, I’d likely use my Yamaha RX-5 in place of the RX-11 for added functionality. 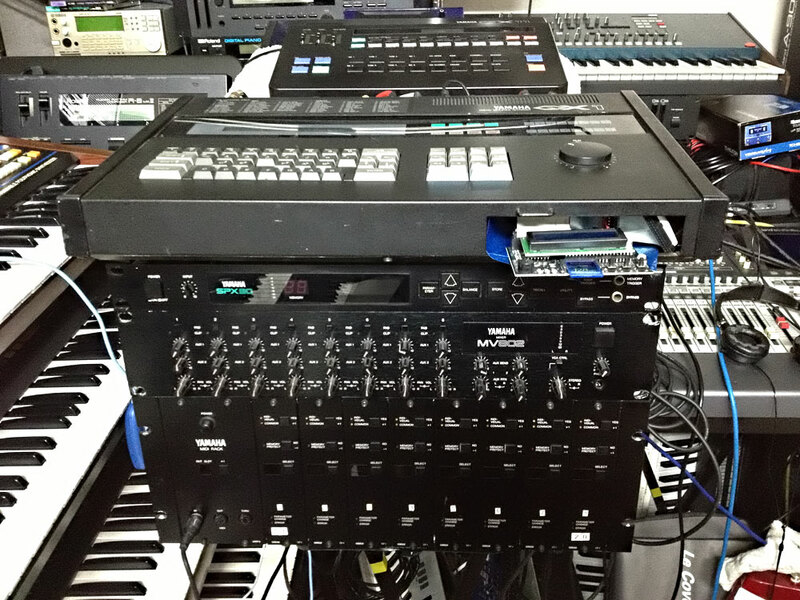 I also would use my Yamaha QX-3 in place of the QX-1 for the floppy drive and consolidation of midi cables. With regards to effects, either the Yamaha SPX-900 or SPX-990 would work well in the mix as they are both multieffect racks unlike the single effect rack of the SPX90. For mixers, the Yamaha MV-802 is not necessary but it works well. You can plug in direct to 8 channels on your main mixer or recording device, but the MV-802 works great as a bridge to cut down on inputs jacks with your main sound mixer. I use my Roland VS-2480 more for my vocal XLR cables. In 1984 I was 14 years old, in the 10th grade and the proud owner of a brand new Yamaha DX7mki. At that time I could only fantasize and drool over a Yamaha TX816, RX11, and QX1 setup. Not to mention having a Yamaha SPX90, or MV802. It’s now a dream come true although considered greatly outdated by many today. All fired up and working though, this setup sounds simply stunning. It’s a lot of fun to work with and the limitations only enhance creativity and excitement of the challenge with working on vintage gear. All of this sits next to my newly acquired Yamaha Motif XF7. It’s amazing how far technology has come. I definitely can recommend the Yamaha TX816. Why people sell these, I don’t understand. I know there is FM8, but the TX816 and it’s 8 DX7 modules are wonderful. I will never sell this thing. EVER!